There are people that like to drink beer. Then, there are people that like to taste beer. People that can tell the difference between different kinds of water, hops, malts and yeasts. Perfectly balanced, those basic ingredients can form fabulous, unexpected flavour combinations. Everybody knows the world-famous citrus aroma of American Pale Ales. It comes from hops, carefully selected from North America’s best plantations. And there’s nothing better than a refreshing German Weizen with aromas of bananas and cloves. Those come from yeasts which also make our beer fresh by producing carbon dioxide. We mean bubbles. We could talk about it for hours. We are the people that go a step further and have created our own beer—Monterale! We enjoy the nature of beer: the community, the craft and the taste. At Monterail, we believe that precision is a key to perfection. This is why we struggle to improve at every step and every aspect of our work, hobby and life. Also, we’re obsessed with Internet of Things and the tinkering possibilities that it brings to all software DIY projects. That’s why we decided to build something to help us brew better batches of Monterale—Breweree system. There are many challenges when making beer at home. Amongst them, proper equipment, hygiene, good recipes, and temperature stand out the most. Temperature measurements are present at every step of brewing. From mashing, through boiling and up to fermentation. Temperature is one of the most important factors that impact the taste, clarity, smell, and strength of the beer. We knew we had to find a better way to monitor its values over time to better understand, compare and improve the taste of our batches. At first, there was simple hardware to be designed. Definitely not something Monterail would do on a commercial basis at this stage. But why not use our hobby-based skills here? Then came the time for some prototype engineering. Wires, sensors and connectors got connected together with a soldering iron. And we made it. It was alive! Actually it was nothing more than a custom PCB—Printed circuit board—with WiFi ESP8266 module. Connected to DS18B20 1-wire temperature sensor and powered with LDO regulator via micro-USB socket. The completed device was measuring the temperature with 0,5 degree accuracy. It sent the measurements to the cloud via WiFi, where they were processed and stored. We put the sensor inside the beer fermentation tank. Then we built a tiny proof of concept web application capable of drawing charts, and it worked. It was a perfect example of simple IoT network monitoring parameters of…a beer! The first batch brewed using this invention was enough to tell that it’s more than helpful. We eliminated unwanted ester aromas from our beverage—bringing it closer to perfection. That’s something, isn’t it? We already knew that this is something we (and probably many homebrewers) need. But we had some problems. The application was not handy and the hardware was poorly designed and too big. So we went for a second iteration (yes, we’re Agile even after hours). This time the goal was pretty clear - make it easy to use, ready to go platform (or at least it’s MVP). Core of the device is the temperature monitoring system. You can use it for fermentation as well as mashing or boiling. You can go even further and use it to track any temperature, anywhere. The sensing part is waterproof and handles temperatures from -55 to 125 degrees Celsius. Secondly, you can install automatic cooler control unit. After connecting it to your cooling device, you can automate the cooling process. We decided to go mobile. What's faster than operating from your smartphone? You take it everywhere, so you can track your temperature levels from wherever you are. If you have a special cooling unit, then you can change the temperature remotely. Or even set this to happen automatically. 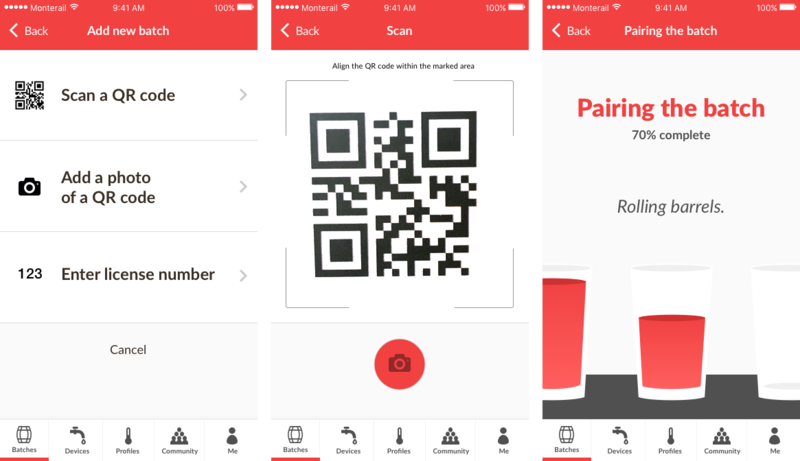 The idea of the app is to collect and track your entire fermentation process. No matter how complicated your gear is, Breweree can help. If you are just starting to brew or your apartment is small, you probably have one batch at a time. But if you are a more prolific brewer, you can have many batches at a time, each having different fermentation profiles attached. Breweree helps track that. Each batch represents the physical fermentation vest with breweree hardware installed. A batch contains all the data about the currently brewed beer. Its name, style, fermentation times and temperatures. 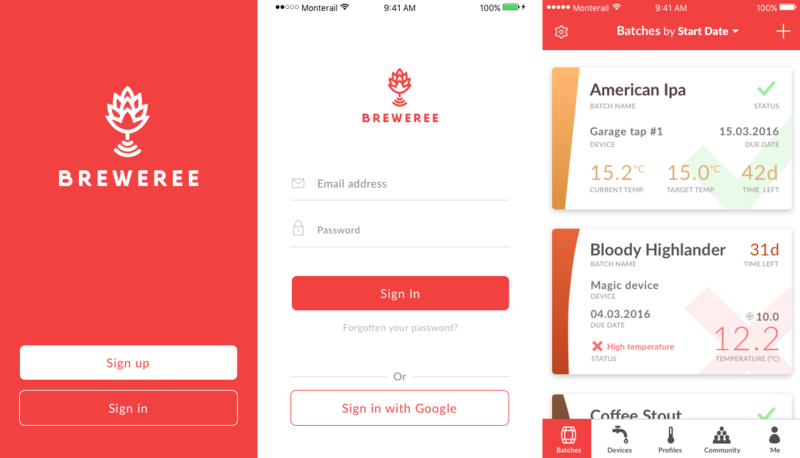 If you make one beer at a time, Breweree can help compare your efforts. Let's say that you made an excellent IPA last year. You wanted to repeat that feat, but this time around it came out sour and you know that you did everything the same way. If you use the app, you can compare those two batches and check for differences in temperature profile. It's possible that you'll find this one peak in temperature that's responsible. If the taste of your beer isn't quite as it should be, you can check all the temperature abnormalities of the fermentation. Compare your fresh batch records with historical ones to brew easier and better! A profile is a part of your beer’s recipe which describes the process of fermentation. It tells how many steps of fermentation should occur (for example: Primary and Secondary), as well as how long each should last and what the temperatures should be over time. 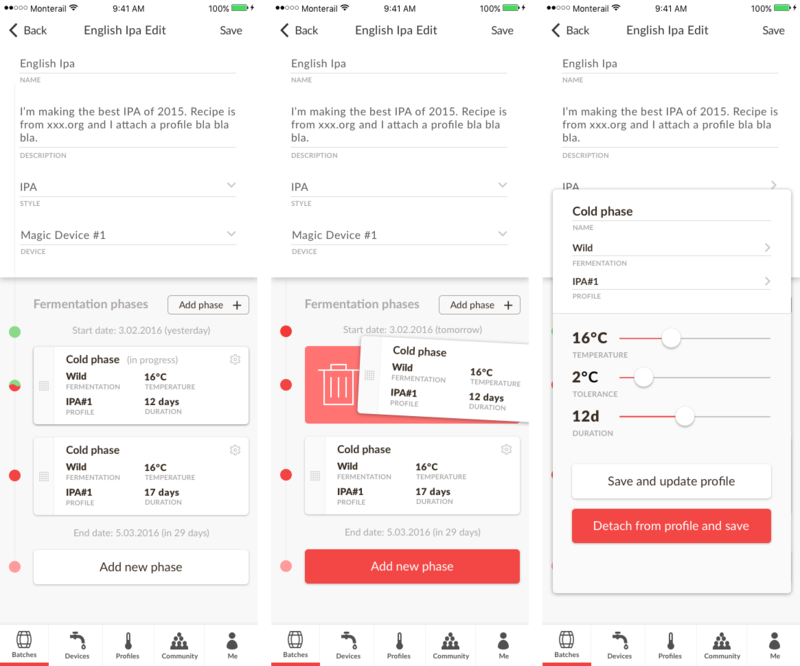 You can select one of the ready-to-go profiles, or create one of your own to make the beer more special. In tracking mode the profile informs you whether the actual temperature is close enough to the desired value. If not, it notifies you to take manual action. 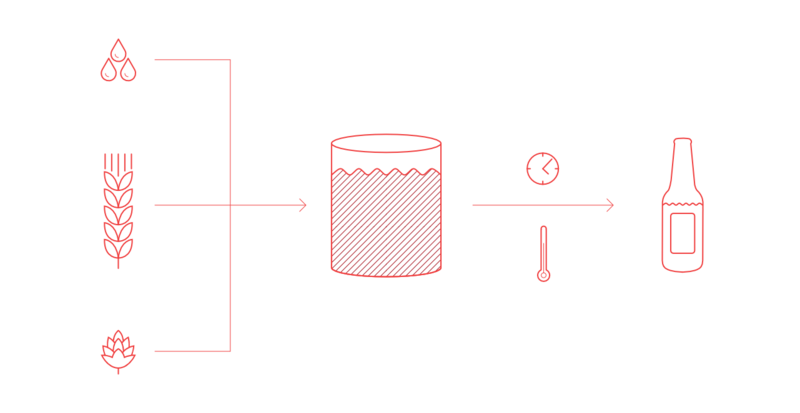 When Breweree is connected to a cooling unit, the profile is used as basic information for controlling its operations, and the temperature is automatically being kept at the proper level. Cooling control is a non-core feature allowing breweree to directly control your cooling unit. One cooling control can collect many batches. More support and details for batches will be coming soon. Breweree is still in the prototype phase, but it’s progressing. We truly care about beer and that’s why it’s our mission to make it available for brewers around the globe! Stay tuned!